Sharran Deora said it took a lot of hustle to get his first job out of school. “I went to Rensselaer Polytechnic Institute. I didn’t have the right connections,” said Deora, who was dreaming of working in banking. He ultimately ended up at Lehman Brothers and then Barclays Capital in product marketing and product management. But now that he’s back out of the finance industry, he’s looking to solve that old problem of finding the right career connections for future graduates. He’s launching an app today called Mounza for Android and iOS, that puts together all on-campus recruiting opportunities in one place. He’s starting with Stanford and UC Berkeley through partnerships with about 25 on-campus organizations like the Stanford Technology Ventures Program and the Berkeley EECS (Electrical Engineering & Computer Science) department. 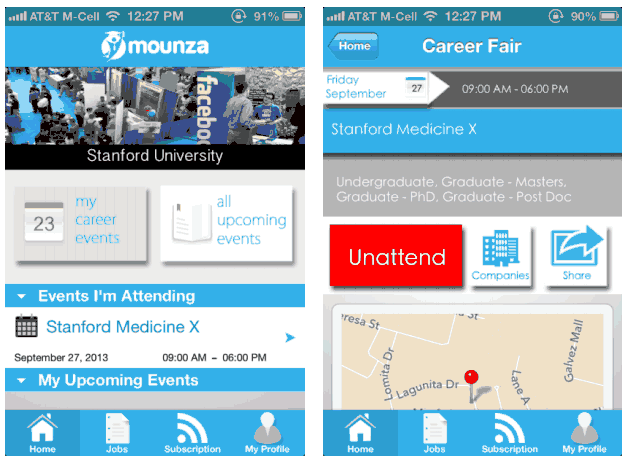 Students can in-put their own events and subscribe to specific career fields for events in medicine or finance. The number of users in the beta right now is still pretty small at about 3,000 users. But Deora said that active users are logging in about twice a day and that the company hasn’t done any active marketing. He says that he’ll be able to expand campus-by-campus by marketing the app through the national parent organizations of different business clubs and fraternities. As for the business model, Deora said he plans to charge recruiting companies and corporations about $100 a month to get access to the app for posting jobs and hosting events.